The first one is me at four months. 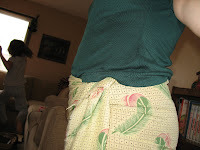 I'm wearing the green shirt, and a yellow African wrap-around skirt, facing left. The second photo, in the blue shirt and maroon skirt, is me at six months. The third photo is me at seven months pregnant, and I'm standing next to my brother! 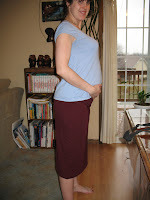 Lastly, in the brown shirt, is me at eight months pregnant.